The Freehold Borough Police Department has immediate openings for Full & Part Time Crossing Guards for the morning and afternoon shifts. Training & equipment for the position(s) will be provided. Salary $14.17/hr. For more information, please contact Monica Bernaducci at 732 462-1233, ext. 102, or visit us at 36 Jackson St., Freehold. The only acceptable recycling materials will be cardboard, newspaper, bottles, cans, mixed and office paper, and plastics (Code #1-2). None of these may be contaminated with food waste. No other materials will be accepted. NO PLASTIC BAGS AT ALL! to access and download the “Recycle Coach” app, for all the latest information on trash and recycling regulations and schedules in the Borough. “TOGETHER, WE CAN HELP KEEP OUR COMMUNITY SAFE” - Please see an important message from the U.S. Department of Homeland Security attached. HOUSING REHABILITATION: Freehold Borough’s Housing Rehabilitation Program is currently accepting applications from qualified homeowners or investor/owners of rental properties who wish to make improvements to their property in order to bring it up to Code compliance. Click here for more information. 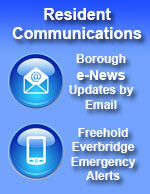 AN IMPORTANT REMINDER FROM N.J. NATURAL GAS - CALL BEFORE YOU DIG! The Easter Egg Hunt scheduled for April 13th has been cancelled due to the anticipated inclement weather later today. The Recreation Commission has rescheduled the event to next Saturday, April 20th, at 10:00 a.m. at the Park Avenue School.